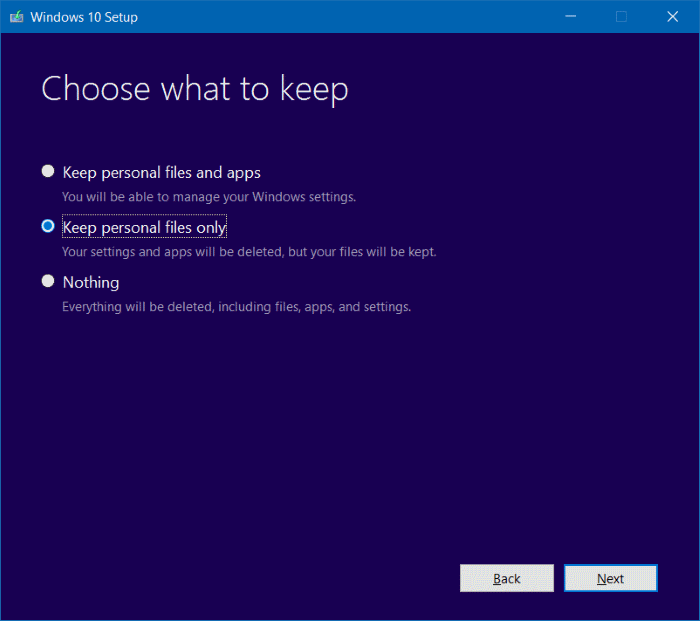 Top 5 Steps to Reinstall Windows 10 without Deleting Files/Folders/App Data! 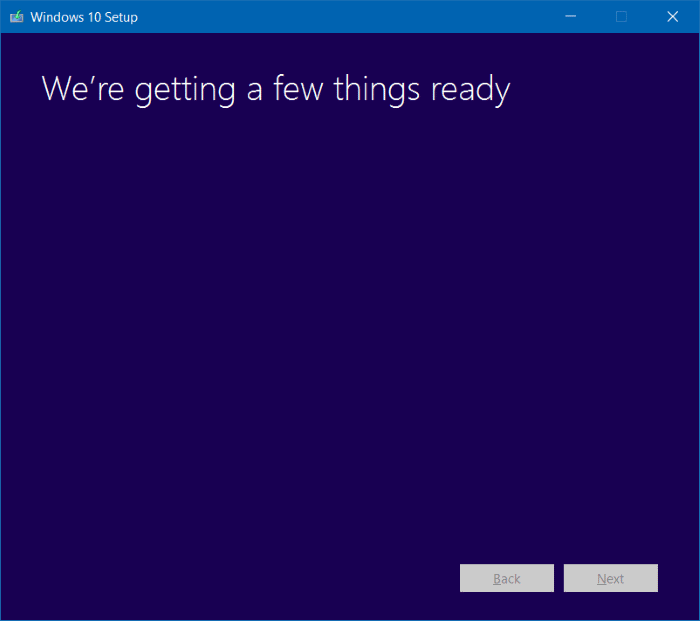 Top 5 Tested Steps to Reinstall Windows 10 without Affecting Personal Files/Folders/App Data and More! Is your Windows 10 system suffering from apparently unsolvable issues? If your answer is YES, then you should reinstall the operating system without worrying about your personal data stored in the computer as now you can easily do the reinstallation process without affecting your personal files/folders. 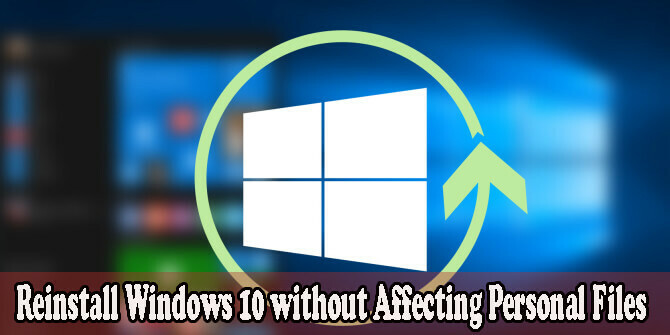 There are several Windows 10 users that don’t know about this trick, if you are facing any kind of problem while using your computer and want to reinstall Windows 10 without losing your documents, pictures, music and other files then this guide will help you to do this. 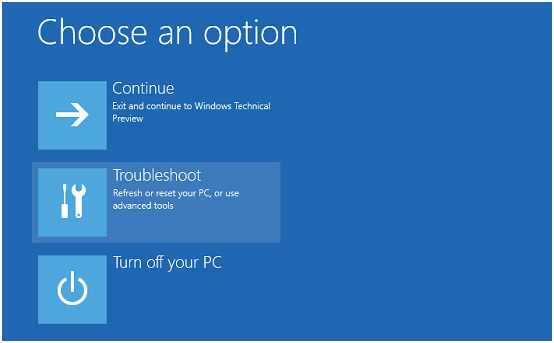 You can go with this method only if your Windows 10 PC is in bootable condition, if you are unable to boot your system then you can’t execute this method to fix your PC. 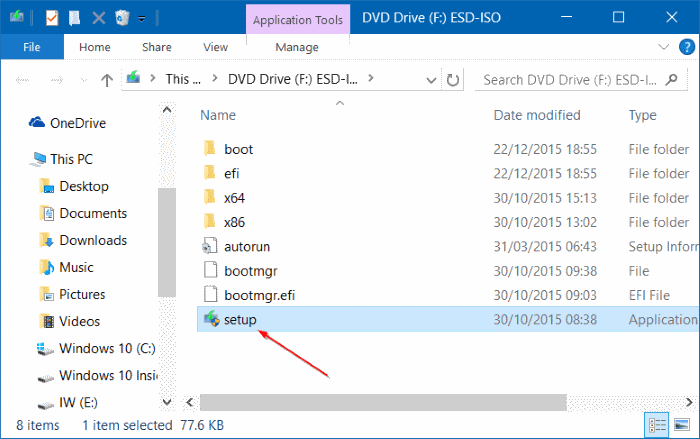 Step 1: At first, if you have bootable Windows 10 USB then connect it or if you have bootable DVD then insert it in the optical drive. Step 2: Now, click on the This PC (My Computer) to open it and right-click on the USB or DVD drive, click Open in new window option. Step 3: Here you will find Setup.exe file, you have to double click on it and then click Yes when the User Account Control dialog box appears. 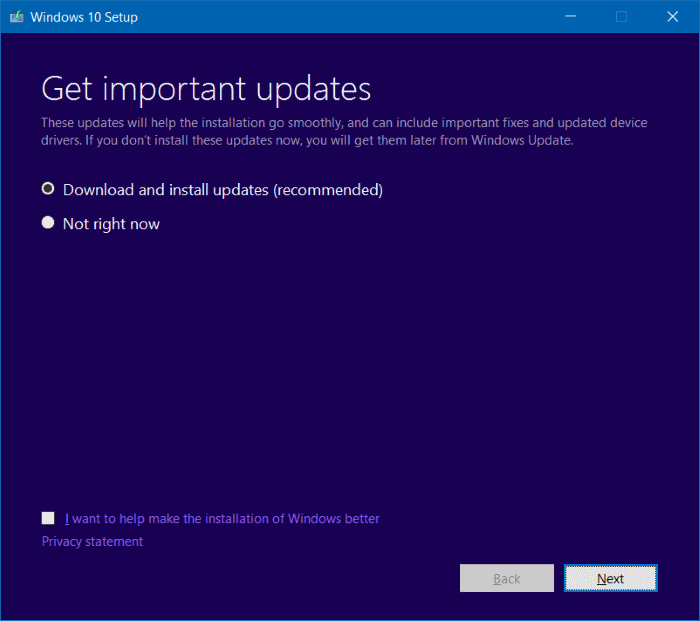 If your computer is connected with the working internet connection then it is recommended to select the first radio button present along with the Download and install updates (recommended). 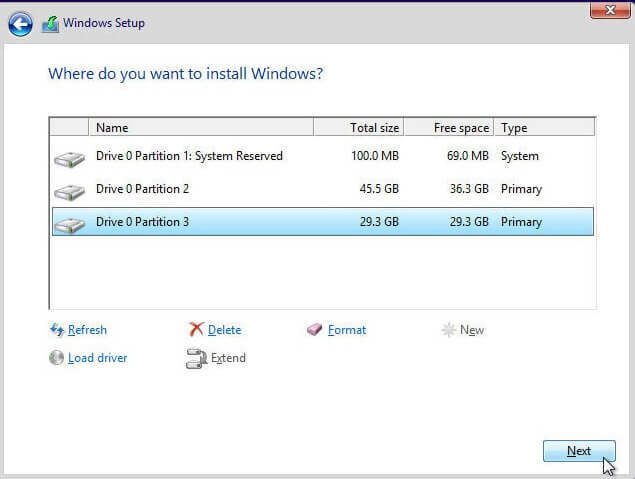 If not then you can uncheck the box labelled I want to help make the installation of Windows better to skip the sending unknown data to Microsoft about the installation process. Choose an option and click Next button. 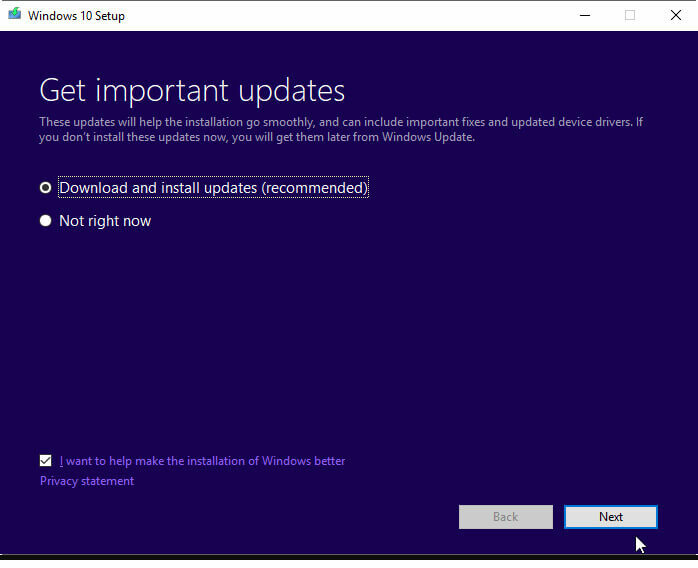 Step 5: After clicking on the Next button, the windows setup will initiate checking for the available updates. But if you have selected Not right now option then this screen will doesn’t appear. Update checking process might take more than 10 minutes. 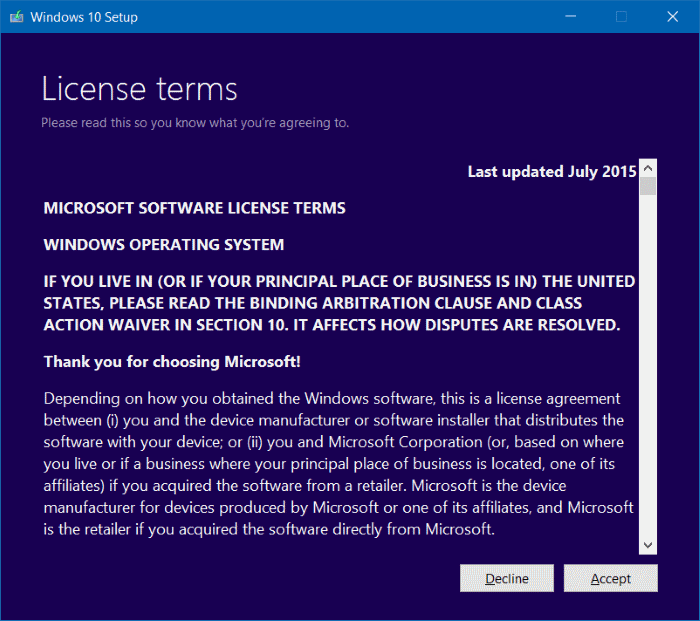 Step 6: After it, a License Terms window will appear, here you have to click on the Accept button. So, you are agreed to the License Terms, now the setup will start downloading the updates, if available. Here in this step, you will see the Making sure you are ready to install window. This window will appear only for a few minutes. 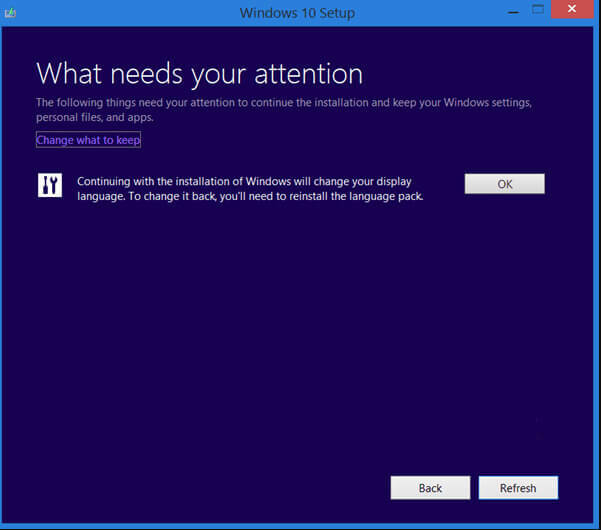 In this process, the setup will check that your PC is capable to run Windows 10, required space and more. 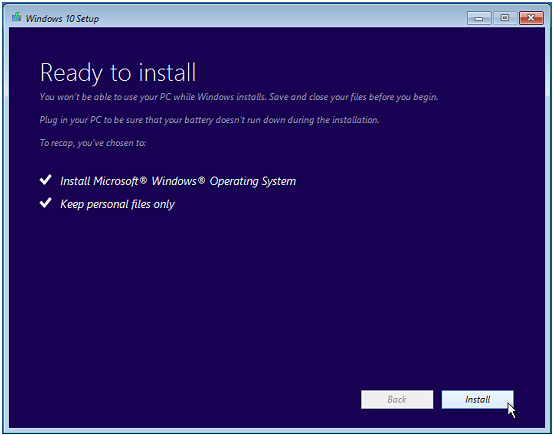 Step 7: Now another window “Choose what to keep” or “Ready to install” window will appear. At this point, you have to alter some settings. Click on the link labeled “Change what to keep”, and choose to Keep personal files only. After doing this, click on the Next button. 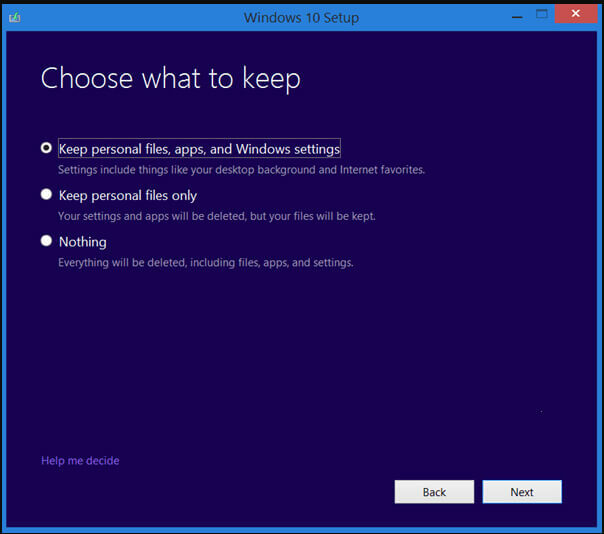 Our main task is to reinstall Windows system without deleting your files, so we have to choose either the first option “Keep personal files and apps” or go with the “Keep personal files only” option. Then click on the Next button. 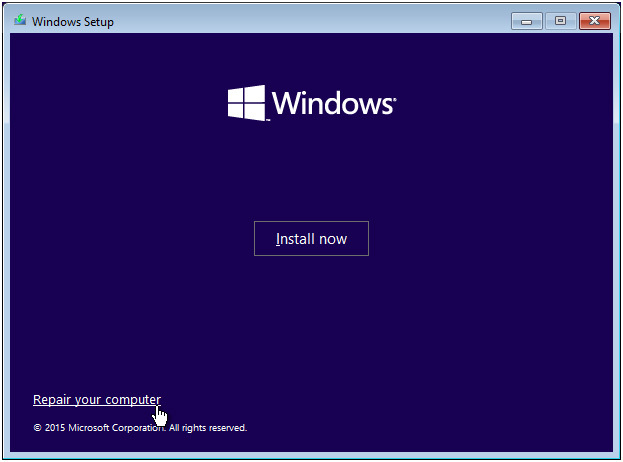 Step 8: At last, Ready to install window will appear along with the Install button. 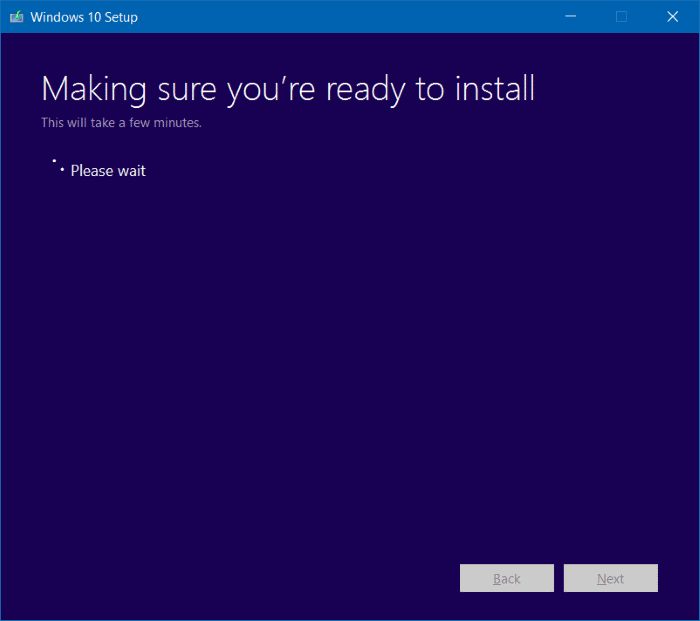 At this step, you have to click on the Install button to start the reinstallation of Windows 10. While this process, your computer or laptop might reboot few times. 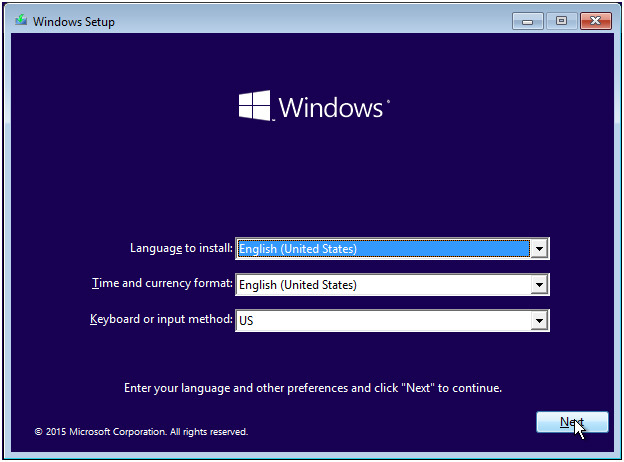 After the completing this installation process, select your country, language, keyboard layout, and time zone. Step 9: Another screen will appear, here click on the Customize settings link instead Use Express Settings button. As this option will allow you to modify the default privacy settings. Here, you have to sign in using your Microsoft account. Step 1: First of all connect your System Recovery Drive or the bootable OS recovery disc and boot your system. You will see a message Press any key to boot from CD or DVD… . So press any key to start the process. Step 4: Here, choose Troubleshoot. 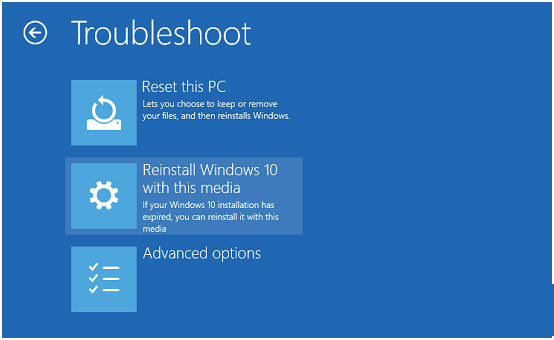 Step 5: At the Troubleshoot screen, press the Reinstall Windows 10 with this media option. 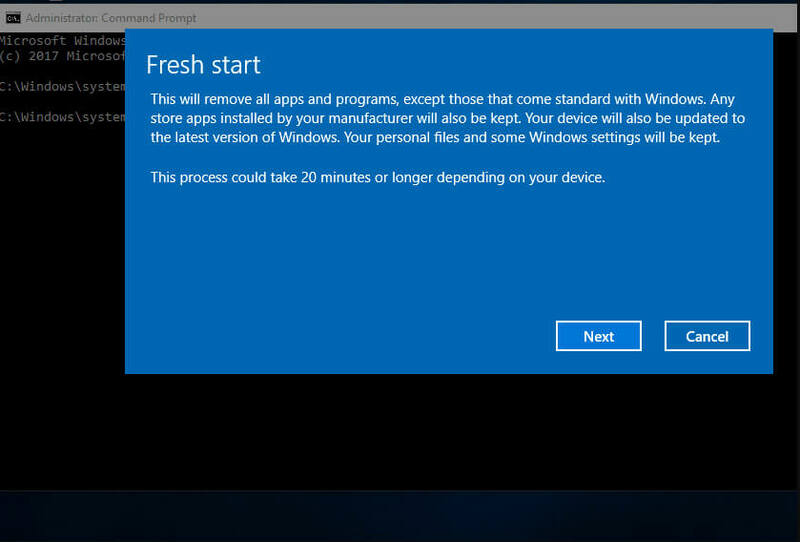 Step 6: After it, choose the target operating system as Windows 10. You’ll see that the system is getting ready itself in the manner to reinstall the OS. Step 7: After the completion of step 6, a screen will appear that give confirmation that all the personal files are kept as it as, while system files may experience modifications. Click on the Install to continue. Step 8: After all, the re-installation process starts. After the completion of re-installation, system will try to restart. If system gets unable to reboot by itself then you can restart your system manually. Step 9: After restarting you’ll get Restoring your previous version of Windows… screen. After the completion of this process, you can log into your system normally and do the essential adjustments to boot newly re-installed Windows. 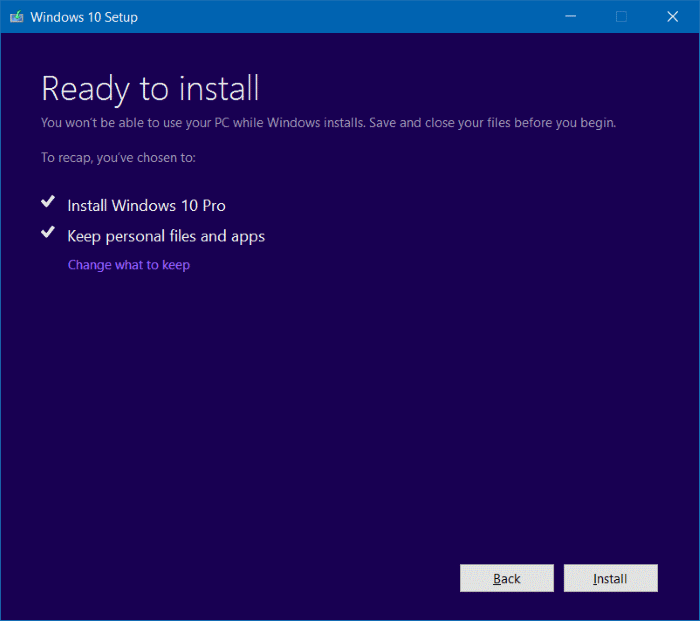 If you are able to boot your system normally, then you can go with this method to reinstall Windows 10 without losing files and apps. First, you have to download the latest Windows 10 installation ISO file or you can also go with the Windows Media Creation tool. With the help of this tool, you have to create an installation ISO. Mount the ISO file by double-clicking on it, now, at the root folder, you have to run the Setup.exe file (double click to run). 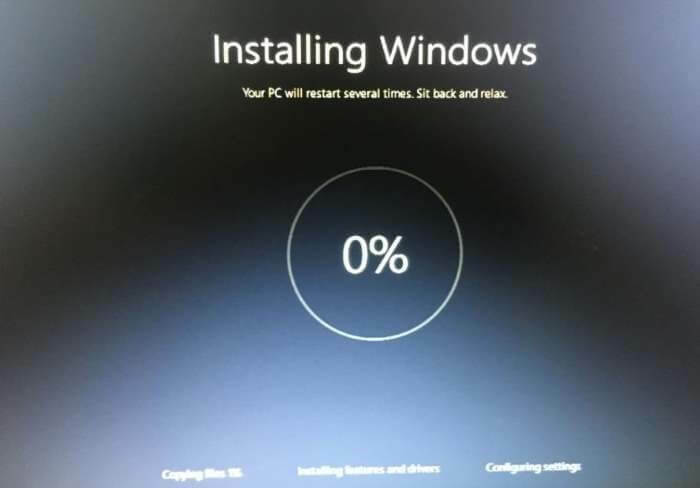 Now, you will see that the Windows 10 Setup is ready to install. Note: At this point, you can either download the available updates or skip this process. In this window, click Change what to keep. Now, either you can select Keep personal files, apps, and Windows settings or choose to Keep personal files only based on your need. 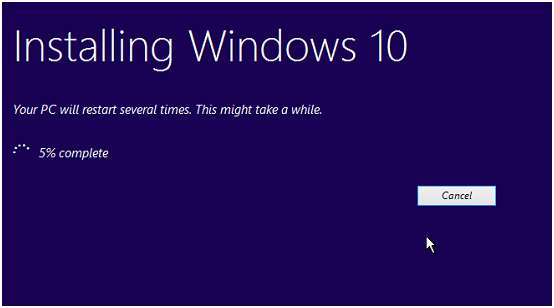 Click on the next button to start the installation process of Windows 10. This process is time taking, and your PC will restart several times so be patient. Settings > Update & Security > Recovery > Reset this PC. After it, follow the on screen instruction to complete the process. Open the command prompt with admin privilege. To do this, go to the search option and search for the cmd. From the search result, right click on the Command Prompt and choose to Run as Administrator. Again hit the Enter key to execute this command. You have to follow the onscreen instruction in order to accomplish the reinstallation process. This trick is suitable for those users who are unable to boot their computer or laptop, and formatting is their last hope. Insert your installation media (disc or pendrive) and boot from it. When it loads the Windows then choose the language and keyword. At the Setup Window, simply select the C: drive and then click Next to proceed. Note: Don’t format the drive. Now, follow the Setup wizard carefully to complete the installation process. Now after the completion of the installation process, when you boot your computer, then in the root directory of C: drive you can find a folder Windows.old. In this folder all of your files are saved. After saving your important file from Windows.old folder, if you want to delete this folder to free up occupied disk space then you can’t simply delete it, as you have to go with the Disk Cleanup option to erase the Windows.old folder. So, this blog contains 5 tricks to reinstall/install your Windows system without deleting our important files, folders, app data and more. All the given methods are different from each other and suits for a different scenario such as PC is bootable but problematic, a computer is not booting completely and more. It is also suggested to scan your PC for any hidden errors, junk files, registry issues and more. As after applying any of the given reinstallation processes, your system may store hidden junk files, registry junks etc by default on its HDD. Run a full scan of your PC using PC Cleaner and get rid of all those junk files to free the space of system’s HDD. Apply the given steps to reinstall Windows 10 without affecting installed applications, your personal files and other data without calling any professional.